© Reuters Protesters have set vehicles to fire, pummeled the police and attacked women who tried to hike up a three-mile trail to reach the temple. As India grapples with questions of how much government institutions should be involved in religious affairs, a violent war of wills playing out over women’s access to one of Hinduism’s most important temples has led to the arrest of more than 2,000 people this week, the police said on Friday. After India’s Supreme Court struck down a 1991 ban that forbid women of childbearing age from praying at the Sabarimala Temple, a centuries-old hillside shrine in the southern state of Kerala, it did not take long for protesters to set vehicles on fire, pummel the police and attack women who tried to hike up a three-mile trail to reach the temple. Thousands of furious devotees — many of them women — have vowed to resist the court’s verdict, saying it would chip away at years of tradition. In recent days, leaders of Prime Minister Narendra Modi’s governing party, the Bharatiya Janata Party, and another powerful rival party, the Indian National Congress, which has traditionally extended rights to minorities, have sided with proponents of the ban. Since the 2014 national election of Mr. Modi, whose party has ties to Hindu nationalist groups, a burst of religious conservatism has swept through many parts of India. When the Sabarimala Temple opened last week for the first time since the court’s ruling, hundreds of baton-wielding police officers braced for a face-off near the shrine, vowing that they would uphold the law and protect any woman who wished to visit the temple. Before the temple closed on Monday evening for two weeks, at least 12 women had attempted the journey. All were harassed. None of them made it. One woman was so shaken that she fainted. Last Thursday, when a female journalist for The New York Times started hiking toward the temple, she was met with a screaming mob of hundreds of people, chased down the hill and hit with a rock on the shoulder. She was not seriously injured. Mr. Krishna said he was worried about the temple’s November reopening, which marks the start of peak season. In the coming weeks, the pilgrimage to the Sabarimala Temple draws millions of devotees, and is often compared locally to the Hajj to Mecca. This week, officials in Kerala released photographs of more than 200 people suspected of violently blocking women from reaching the temple. Some were members of far-right Hindu sects. Next month, 5,000 additional police officers will be deployed in the area. “It’s going to be a huge task,” he said. In India, a multiethnic country of 1.3 billion people, court mandates are often loosely enforced, especially in rural areas. 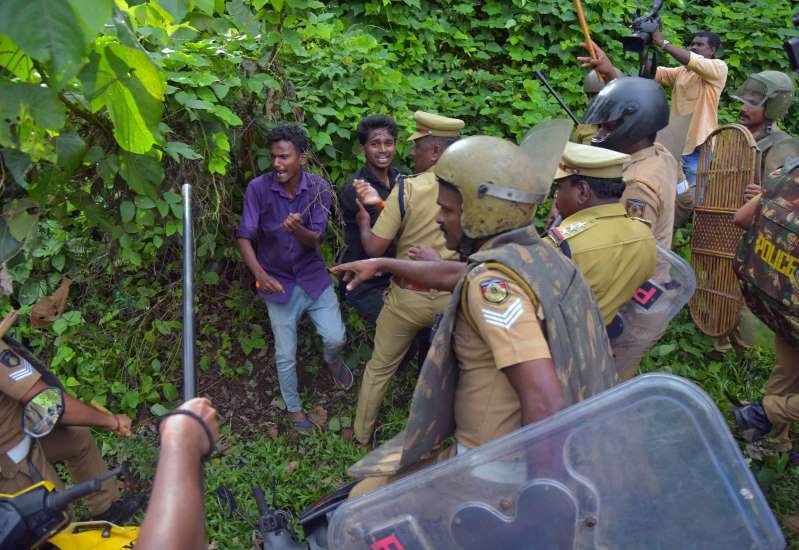 But the police in Kerala, a highly literate state run by a coalition of communist parties, have encouraged women to visit the Sabarimala Temple, despite the security risks. But advocates of the ban say that women of childbearing age, defined by temple caretakers as those between 10 and 50 years old, should not be allowed to visit because the shrine’s deity, Lord Ayyappa, is celibate. Some Hindus consider menstruating women to be impure. The Supreme Court announced on Tuesday that it would hear 19 review petitions next month challenging the ruling, though lawyers said it was unlikely that the decision would be overturned.